Experience Full HD with the Dell 23.8" Inspiron 24 5000 Series Multi-Touch All-in-One Desktop Computer. The 23.8" IPS display includes a 1920 x 1080 screen resolution, and a 16:9 viewpoint proportion. You can also output video to an external display using the HDMI port. It's screen display supports multi-touch support. The articulating stand allows you to change the viewing angle according to your preference. It also supports a 100 x 100 mm VESA mount with a m4 screw (sold separately). 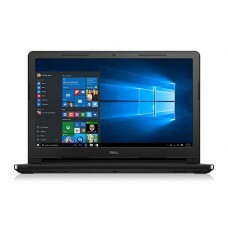 The Dell Inspiron 24 features a 6th-Gen Skylake Intel Core i7-6700T quad-core processor that can achieve a base speed of 2.8 GHz in order to give optimal performance for everyday tasks. New Intel Turbo Boost 2.0 technology helps the CPU to speed up to 3.6 GHz. Its in-built Intel HD Graphics 530 delivers best visual performance for games and HD movies. The Dell Inspiron 24 features a 23.8" IPS display, which has wide viewing angles and a matte finish. The screen also has a 1920 x 1080 screen resolution and a 16:9 aspect ratio so it can play Full HD content natively. You can also output video via the HDMI port. The screen also has multi-touch support. Featuring dual-band 802.11ac Wi-Fi, the Dell Inspiron 24 delivers high performance, broader coverage, and longer battery life than previous Wi-Fi standards. The Dell Inspiron 24 also comes with Bluetooth 4.0 technology so you'll be able to connect wirelessly to Bluetooth-compatible peripherals and accessories. A Dell wireless keyboard and mouse are included so you can get started right out of the box.